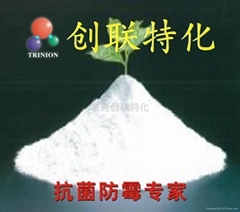 As the most professional expert that specializes in providing the material and technique of antimicrobial in China, Trinion Chemical provides professional product & measure to solve your problems of anti-bacterial, anti-mildew/fungi, anti-algae, anti-mite and odor-proof in wide field including: - Textile & leather: chemical fiber and cotton fabric, shoes, socks, underwear, garments, bedding; natural & artificial leather; - Plastic & rubber: food container / package, medical tools & utensil, toys, kitchen tools, bathroom ware, water pipe / case; foaming-plastic, etc. - Painting: water-based & powder painting, adhesive, etc. - Bamboo, wood, grass: woven artwork, furniture, etc. Full-scale technical support: - Free sample for test! Free technical instruction in factory! Complete supporting documents including certificate. - Free treatment of your textile sample! Tag service available! (SiShield only) Brief introduction of our product: - EPA registered SiShield antimicrobal for textile with very high safety to human & environment. Only 2-4%o.w.f. 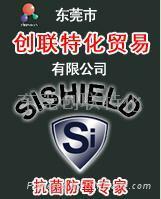 is needed to achieve >99% anti-bacterial and 0 grade anti-fungi. Works perfect odor-proof & against Escherichia coli, staphylococcus aureus, Klebsiella pneumoniae, candida albicans and aspergillus niger etc. The treated product can run through more than 30-50 repeated laundry. 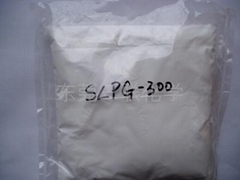 - EPA, FDA registered Silver ion based antimicrobial powder - product of Japan, provides anti-bacterial rate of >99% with dosage of only 0.3%. It brings very low affect to transparency or color of plastic. 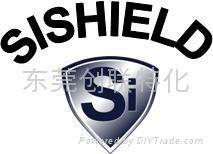 Highly safe to human & environment, food container, package, etc. Also works very well against Methicillin Resistant Staphylococcus Aureus. - EPA registered SiShield antimicrobial spray for shoes: low dosage of spray is enough to achieve antimicrobial & odor-proof effect. - EPA registered Rohm & Haas antimicrobial product: VINYZENE SB-27, IT-4010, etc..